Do you have a special garden that you have visited? One that lingers in the memory, which gave you lots of ideas for your garden or which just felt so wonderful to be in? 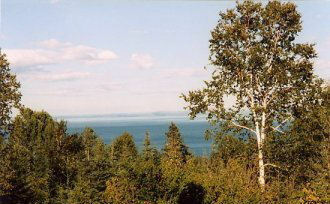 My choice would have to be Les Quatre Vents which is in Charlevoix County, Quebec, Canada. It is now almost 10 years since I visited the garden, but the wonder of that day is still with me, aided I have to admit by the wonderful book on the garden that my brother in law found and sent to me. But I digress, let me take you through the story of how we came to visit. 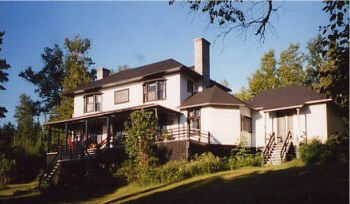 A group of us were holidaying in a house in rural Quebec overlooking the St Lawrence. Before we went, I did my research and discovered that Les Quatre Vents was close by. However, it only opens on four days a year and whilst our visit coincided with one of the days, they were already sold out, two months before our visit. It looked as if we would be unable to see these wonderful gardens. However when we arrived at the house, we found that the property came with membership of the gardens which allowed holders to visit on Wednesdays in addition to the four general open days. This was wonderful news. Not only were we able to visit, but also there was virtually no one else there so we almost had the garden to ourselves. There were two gardeners in the party, myself and my brother in law, and a few more who had an interest in the topic and so were interested in coming too. Two were not the slightest bit interested in topic, but decided to come with us for an hour or so and then they would go off elsewhere. To give you an idea of how inspiring this garden is, our two non-gardening friends decided to stay with us for the whole visit. Les Quatre Vents is a garden of rooms, some small and intimate, others much larger. You enter the garden near the house. The garden near the house has a very homely atmosphere. This is no grand garden, but rather the sort of garden that many of us would have outside the house. It feels as if it has been there since the house was built in the 1920s. In this part of the garden, you get no idea of what you will find as you explore more. There are lovely stone edged beds and very typical planting. The key thing that struck me here was that the impact of Canadian winters is that plants have a much shorter growing period and so plants that would never flower at the same time in the UK, such as roses and aqualegias, were flowering their heats out together. It was a little like being at Chelsea, only in a real garden. From there we moved on and it wasn’t long before we started to realise what a wonderful garden this is. First we came to a number of garden rooms separated by tall hedges. 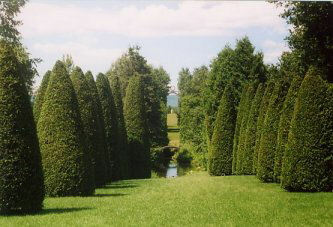 One contained a “long border” and another topiary. One was very narrow and simply contained a long rill with grass on either side. One started to get a feeling of the excitements that were to come. Almost every gardening device is employed somewhere at Les Quatre Vents. On occasions, you get glimpses of “borrowed” views. Another time, we thought we could see a statue, but we didn’t remember seeing it when we were near to where it appeared to be located. We walked back and found that the “statue” was in fact a carefully placed silhouette, made from what appeared to be hardboard, which was not obvious when you were near it. As you move further from the house, the garden rooms get larger. There was a beautiful music room in the middle of a lightly wooded area, a Chinese pond and then we came to the ravine. There was a wonderful rope bridge to cross this by. The only problem is that I have a fear of heights and, in particular, swinging bridges. The intrepid members of the party took the bridge and then had to wait for ages for me to finally reach the other side by the land route. Thank goodness the trek to the other side was worthwhile. Having walked along a lovely tree lined path through what appeared to be a spring garden, we came to the Pigeon House. This is a huge archway building with the most amazing mosaic under it. It is a focal point on this side of the garden. From there we ventured on to a hedge surrounded area. About half way down were two side arms, like transepts in a church, where there were six foot high frog musicians. One group were playing jazz and the other classical music. Not only could you see the characters, but as you moved close to them, appropriate music stated playing! From there we moved on to the Japanese garden, and then we went back toward the house to explore the other side of the garden. I will admit that by now we were tired, there were so many wonderful sights that we had seen that our brains were starting to flag a little. We went past the on stream fed swimming pond, which fits so naturally into its surroundings with its surface flush with the thyme lawn it sits in and eventually reached the vegetable garden. 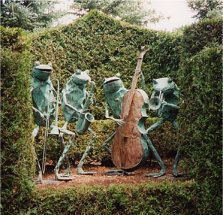 Les Quatre Vents is the most amazing garden I have ever seen. I highly recommend a trip to the garden if you can possibly manage it. If you do decided to go, make sure you book your tickets for the garden a long time in advance, they can sell out six months before the opening dates. Being a private garden, there is virtually nothing online about the garden. It opens in aid of Centre écologique de Port-au-Saumon, and you can buy tickets on their website. If you can’t get there in person, then look out for the book on the garden – “The Greater Perfection” by its owner Francis H Cabot. It is not a cheap book, but probably cheaper than a visit for most of us. Amazon has a few pages available to look at. Other than that, there is a virtual tour that gives you an idea of what the gardens are like. 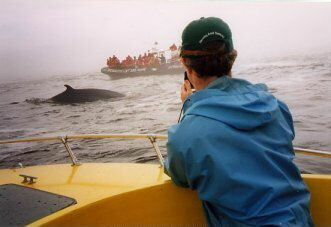 It is really worth making the trip to the St Lawrence, and while you are there, you might want to fit in a whale watching session as well. Writing all of this has made me think that I really have to go back to Les Quatre Vents again to soak in its magic once more. Ok, so you have been seeing loads of pictures of my garden that I share with my dogs, now here is your chance to show off your garden. Whether it is a work in progress or something that is a little more mature, so long as you don’t have a seperate areas of the garden for you and your dog(s), send me the pictures and I’ll put a selection in a new gallery section on this site. I need at least three pictures and up to 500 words to describe your garden and dog(s). Make sure that at least one of the pictures includes your dog(s). Pictures should be minimum 600 x 400 pixel resolution. Just fill in the form below with some basiscs about your garden and then we will get the process going. This is the International Year of Biodiversity, designed to focus us on the decline that is currently being seen and as a spur to get us to do something about it. The RHS is currently promoting this campaign. So what can you do to help? Having a nice garden isn’t just about making life pleasant for your and your dogs, we all have a role to play in the biodiversity of our planet. As we increasingly use land for housing rather than agriculture, wildlife is depending more and more on our gardens for survival. There are many forms of wildlife that your gardening efforts can benefit. When people talk about wildlife, we all naturally think of insects and birds, but let’s start a little lower down the food chain. I am lucky enough to have lichen in the garden. 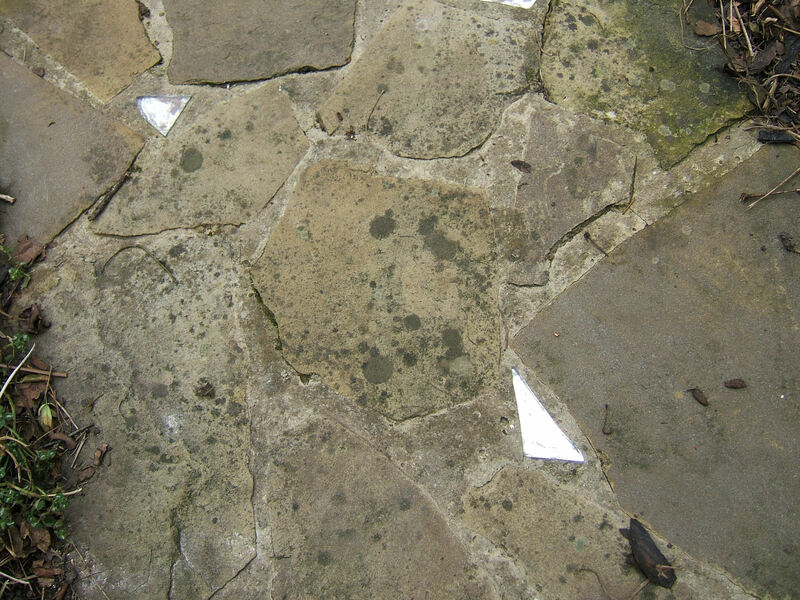 It loves my York stone paving. I used to worry that my pressure washing would remove it, but no, the lichen survives it just fine and continues to thrive. It is interesting to see that the lichen doesn’t seem to like the man-made paving that I have. The more variety you have in your garden, the more forms of wildlife you can help and the more interesting your garden will be to look at. For an idea of the sort of plants you might want to grow, take a look at some recommended plants. You may also want to take a look at the RHS Plant Selector. We are all used to the concept of nesting boxes, but have you thought about a ladybird box? Not only are ladybirds very pretty, but they also love to eat aphids, so encouraging them into your garden can reduce any aphid problem too. 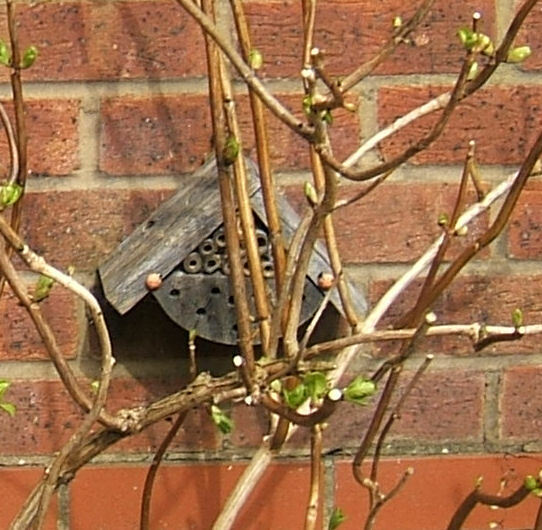 If you do choose to have nesting boxes, then make sure they are in out of the way areas of your garden. I have a couple of nesting boxes. One is outside our kitchen window, which looks out onto a corner of the front garden. That part of the garden is little used, but very easy to see, so it is an absolutely perfect location. One benefit of having dogs is that you are unlikely to see cats in your garden, so the birds are free from that danger at least. Larger birds like to nest in large shrubs. A couple of weeks ago, I saw blackbirds building their nest somewhere in my Bay. 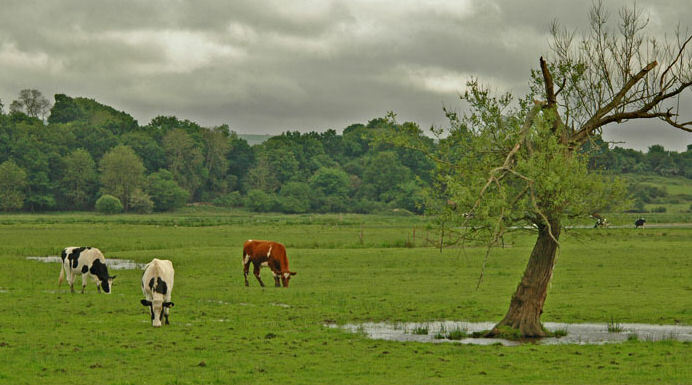 There are so many things that you can do to help improve biodiversity. Just having a garden is a great start, but how about thinking what you can do in your garden to help improve things just a little? My mother always used to quote the first two lines of this poem, but didn’t know any more. It drove me mad so when I had to learn my own choice of poem for an exam as a teenager, I went out and found it. Funny thing is that I still only remember the first two lines, but I love the whole poem. There is now a Facebook Group dedicated to Gardening and Dogs. Come and join us.